Located in the heart of campus, nestled between The Treehouse and Union Square cafeteria, the Coffee House (CoHo) has become a popular landmark at Stanford. Embellished with cartoons of famous Stanford graduates, the dimly lit eatery hosts a variety of events, from musical performances to storytelling nights. Behind the bustle of the CoHo however, lies a tumultuous past. In the summer of 1966, the precursor to the CoHo, the ASSU Coffee House (AS-SUCH) opened in the old International Center, filling the need for a student social location. “The coffee house met the need for a student gathering place with more privacy and atmosphere than the Union,” a Daily editorial argued (“The Coffee House,” Oct. 4, 1966). However, this gathering place faced opposition from Associate Dean of Students Joel Smith, who feared that AS-SUCH could be used as a place for “heavy drug trafficking.” Smith suggested that coffee houses be placed instead in individual residences across campus. After negotiating with the ASSU to manage potential drug trafficking, the problem then became location. With limited space on campus for a coffee house, students protested that the University was de-prioritizing student issues. “It is more important that the various departments have more space than that the students have a place where a much-needed type of learning and development might go on,” wrote Tim Haight ’66 Ph.D. ’79 in a Daily editorial (“Coffee house controversy stalled,” Oct. 21, 1966). The controversy ended when the Coffee House found a home at Tresidder Union. In 1980, Coffee House Inc. was established as a subsidiary organization of the ASSU. Coffee House Inc. then won the bid for operation of the Coffee House, setting up a board of directors to run the organization. “The board, which is comprised of 10 members from the student body, alumni, staff and faculty of the University, will be in charge of establishing short- and long-term goals for the Coffee House and will work to make sure that it fits into the Tresidder framework,” reported The Daily (“Butterfield to head Coffee House board,” April 23, 1980). 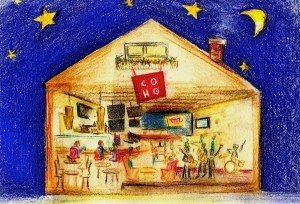 While the CoHo was destined for closure in September 2007 due to Old Union renovations, students demanded its return. It was re-opened in June 2008 as a collaborative effort between Ray Klein, also owner and manager of The Treehouse, and Stanford Student Enterprises (SSE). SSE was in charge of social events, in the hopes of making the CoHo more appealing to students. Throughout multiple closures and controversy, the CoHo has managed to keep its place on campus, aided by a supportive student body.